Everyone needs financial advice they can trust. We get to know our clients, because financial planning involves important life decisions. We keep the process simple, and make sure each one of our clients can plan their finances with confidence. You will notice the friendly, professional and personal feel of our business. We will help you find your financial freedom. Stuart completed his Bachelor of Business, Accounting degree at Mitchell College of Advanced Education (now Charles Sturt University, Bathurst) in 1987. He is a Chartered Accountant and a Certified Financial Planner. After six and a half years working in Sydney, including three and a half years with KPMG Peat Marwick, one of the big four accounting firms in Australia, Stuart returned to his home town of Bathurst and became a Partner in a prominent local business. 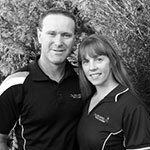 Always looking for new challenges, Stuart and his wife Julie opened their own business in 2008 – Breakfree Financial Management. In establishing Breakfree Financial Management, we saw the need in the financial services industry for a truly personal approach. We want to help you ‘Breakfree’ from your financial worries, to achieve financial freedom and enjoy life! Let us talk through your financial strategy today and explain the risks and benefits of planning for your future. * Taxation support services are provided by Breakfree Accounting & Taxation, ABN 29 343 494 538.